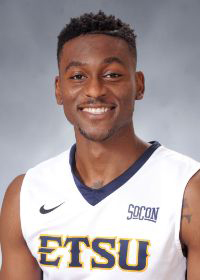 Deuce Bello, a transfer player from Missouri, is about to begin his final season on the ETSU men’s basketball team. Bello is from Greensboro, North Carolina, and is the son of Bummy Bello. He attended high school at Westchester Country Day School, where he averaged 19 points per game as a junior. While in high school, Bello was a three-­time all state selection and was ranked No. 53 in his recruiting class. Bello has already earned a bachelor’s degree in general studies. As a senior at ETSU, his current major is sports communication. Bello began his collegiate basketball career at Baylor before transferring to Missouri and then to ETSU. Like many athletes, Bello’s decision to play sports was influenced by a family member. Bello has the experience needed to help prepare his ETSU teammates for tough competition. During his freshman and sophomore years, he played at Baylor in one of the toughest conferences in college basketball, the Big 12. “My time at Baylor…prepared me for toughness, speed and guards being more physical in the Big 12,” said Bello. Coming into his recruitment, Bello had many colleges to choose from, including Baylor, Louisville and Wake Forest. “If I could redo my college choice, it would be Louisville because they won the national championship that year,” said Bello. Though Bello has achieved many accomplishments in his basketball career so far, he is most proud of going to the Elite 8. That year, his team went 30-­8, losing to Kentucky in the Elite 8. There will be a lot of expectations for the Bucs this upcoming season. Along with returning players, coach Steve Forbes has brought in promising transfer players. “We want to win conference and win meaningful games in the NCAA tournament,” said Bello. To do that, Bello knew he had to improve the parts of his game that he would need to play at the next level. Coming into his final collegiate season, Bello feels he has more confidence and a better IQ to help with decision making. “If I could play a team that’s not on the schedule, it would be Missouri and Baylor, just because I went to those schools,” Bello said. With his athleticism and shot­taking ability still improving, Bello has the potential to play at the next level. Bello’s favorite player is Russell Westbrook, and his favorite team is the Oklahoma City Thunder. If he could play anyone in a one-­on­one game, it would be Kevin Durant because he is Bello’s second favorite player. The Bucs will be in action Nov. 14 against Averett coming off their big win over Tusculum in their exhibition game. In that game, Bello was very efficient, scoring 20 points in just 17 minutes. He went 7-­for­-8 in shooting, and he went 3­3 from three­-point range.